Welcome to The Employee Mobility Institute ( TEMI ) Resource Centre! Our goal is to provide you with meaningful and relevant resources to help you and your business. Save time and costs by finding the right information simply and easily – and all in one place. 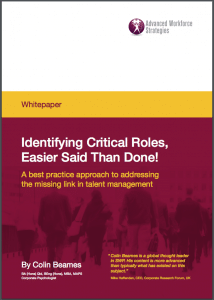 The business case for identifying Critical Roles is compelling. Click Here to download your Free Whitepaper – Identifying Critical Roles, Easier Said Than Done! Please provide your details to download your whitepaper! Private International Medical Insurance or Travel Insurance?